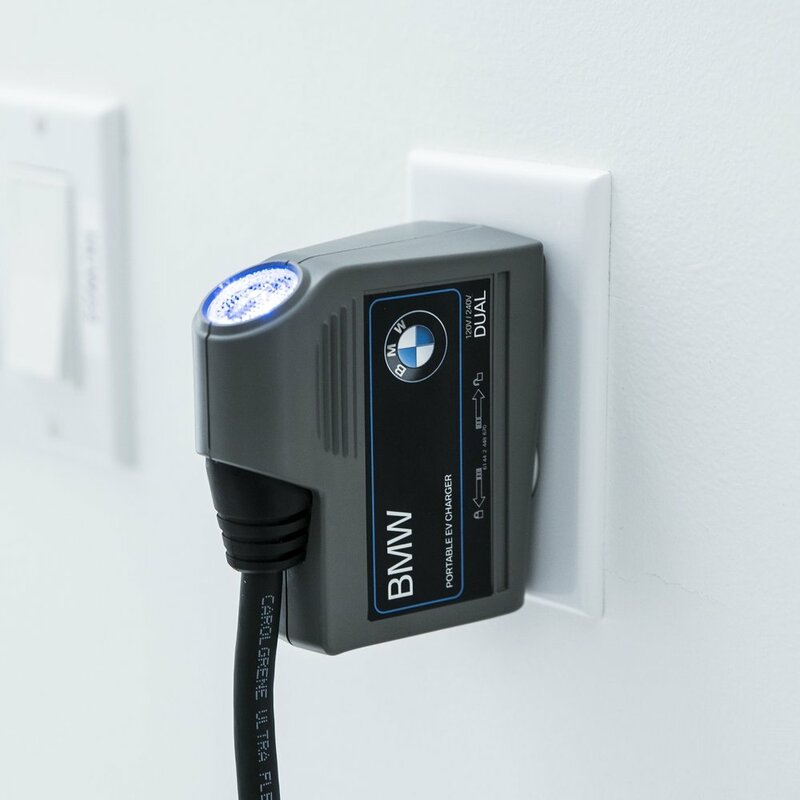 Enjoy all the driving fun of BMW right from the start, with easy access to a network of certified installers in your area to manage the installation of your BMW TurboCord Portable Charger or other home charging solution. Enter the address of where you want the charger installed. We will confirm if there are pre-qualified installers nearby. You will then enter your email address, and promptly receive an email containing a self-guided Home EV Readiness survey. The survey will save you time and help your contractors provide you with a more accurate bid. Up to three installers then submit a personalized, no-cost and no-obligation bid for your home charging installation. Select the bid of your choice. Your selected installer will then contact you to schedule a convenient time to install your home charging solution. The BMW TurboCord provides two convenient charging solutions. The first option is to plug it into a standard household outlet (120v), which typically takes 7 – 28 hours to fully charge, depending on your vehicle. This is referred to as Level 1 charging. Your second option is to upgrade your electrical outlet to 240v, reducing the charging time to less than 8 hours. This is referred to as Level 2 charging. Upgrading your electrical outlet to use the BMW TurboCord as a Level 2 charger requires a certified electrician to install. That's where BMW Installation Services comes in, quickly connecting you to a certified installer in your area. Engineered to BMW specifications, the TurboCord at Level 2 charges nearly 3x faster than the Occasional Use Cable (OUC). BMW Installation Services powered by Qmerit provides convenient access to a network of qualified, professional, and certified contractors across the U.S. to manage the home installation of the BMW TurboCord or other home charging solution – from start to finish. To prepare for your new e-mobility lifestyle with confidence, we recommend that you select a Qmerit-certified installer. Get started today. Thanks to BMW Installation Services powered by Qmerit, BMW drivers are easily connected with qualified installers nearby to ensure a seamless installation experience—beginning with a no-cost, no-obligation bid. To get started, click FIND AN INSTALLER. If you have any additional questions, please fill out the form below to contact our Customer Service team. Thank you! We have received your request and will respond to you shortly. Return to site.